Years in the making, from the award-winning team of Brian Michael Bendis and multimedia sensation David Mack, comes a brand-new graphic novel experience. And it's all kind of based on a true story. Sort of… Deep in the American intelligence community, someone realizes that comic book creators, who travel all over the world to sell their wares, might make the perfect cover for operatives in the dangerous, topsy-turvy world of intelligence and counterintelligence…and that's when all hell breaks loose. This is the story of the time the world of comics and the world of international spywork smashed together-with unexpected results! 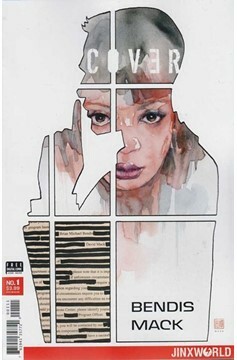 Artist David Mack, follows his Emmy nominated work on Jessica Jones, and his critically acclaimed video work for Dashboard Confessionals and Amanda Palmer, brings another completely unique vision to this driving comedic spy story that is also a beautiful Valentine to all those creators who sit alone and make beautiful stories..